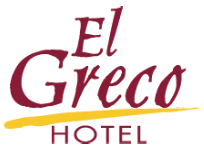 What better name for a hotel than that of a great artist "El Greco", both conjugate a series of characteristics that makes them similar: love for perfection and a taste for beautiful things, like a Masterpiece. El Greco is the nickname by which Doménikos Theotokópoulos is popularly known, a Spanish Mannerist painter considered the first great genius of Spanish painting. He was born in 1541 in Candia, Crete and painted in a late Byzantine style. El Greco was a man of great erudition, fond of classical literature. Around the year 1566, he moved to Venice, where he remained until 1570. He received a great influence from two of the great masters of the Renaissance. Assimilating the color of Titian, and the composition of the figures and the use of wide and deep spaces, by Tintoretto. The influence of the work of Michelangelo Buonarroti is evident in his Pieta (1572). The study of Roman architecture reinforced the balance of his compositions, which often include views of Renaissance buildings. In Rome he met several Spaniards who persuaded him to travel to Spain. In 1577 he arrived in Toledo and soon received the first order from the church of Santo Domingo el Antiguo and went to work at La Trinidad (1579). El Greco's work as a portraitist was very significant. One of the greatest exponents of this work is the famous painting The Knight of the Hand on the Chest (1584). He also worked for the Cathedral of Toledo: The Pillage (1579). In 1586 he painted one of his masterpieces, The Burial of the Count of Orgaz, which shows the lengthening of figures and horror vacui (fear of empty spaces), typical features of El Greco. His personal vision was based on his deep spirituality, in fact, his canvases show a mystical atmosphere. El Greco enjoyed an excellent position in Toledo, where he received members of the nobility and the intellectual elite, such as the poets Luis de Góngora and Fray Hortensio Félix de Paravicino, whose portraits he painted. He also painted some paintings of the city of Toledo, themes of classical mythology and the Old Testament, such as the unfinished work that shows the apocalyptic scene of The Fifth Seal of the Apocalypse (1608), testify to El Greco's humanist erudition and how Bright and innovative was the approach that gave traditional themes. He died in Toledo on April 7, 1614.